Farmers from the Krasnodar Territory in southern Russia, who are fighting against the dominance of agricultural holding companies, organized a tractor march on Moscow in protest. Experts believe that their action is unlikely to change the situation: In the agricultural sector, the state relies on large producers. When the patience of small-time farmers in the Kuban steppes of southern Russia finally ran out with local authorities’ failure to take action against corrupt agricultural holding companies, they decided there was only one option: take their complaints to the very top. On Aug. 21 a column of 17 tractors driven by a delegation of local farmers set out from the village of Kazanskaya in the Krasnodar Territory with the aim of driving all 930 miles to the Kremlin in Moscow. The protesters were intending to meet with Russian President Vladimir Putin and complain on behalf of Kuban farmers about graft and the illegal appropriation of land, which they say is rife in the region. According to the disgruntled farmers, Kuban's large agricultural holding companies act like raiders, appropriating smallholders’ land by deception and bribing local courts. 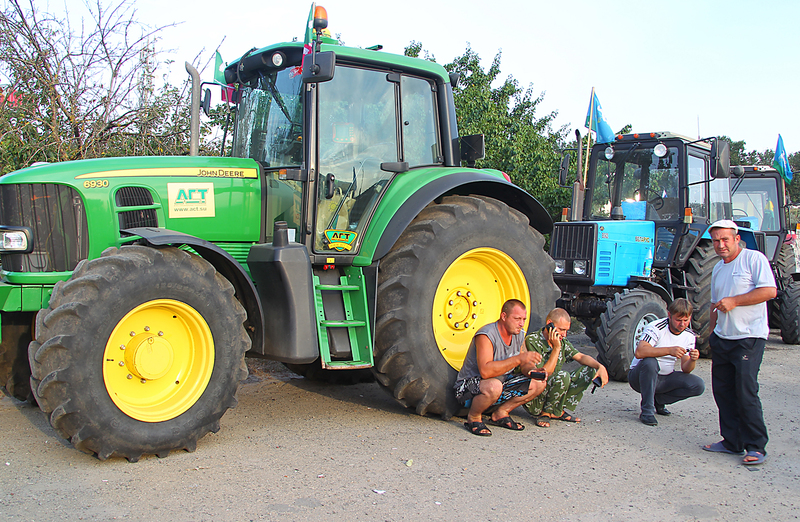 "Now people have their land with crops seized, and no one does anything," Alexei Volchenko, one of the organizers of the tractor march, told the Kavkazsky Uzel website. "The regional authorities do not solve our problems, even though a working group was established for this purpose." The protesters had been planning to drive all the way to Moscow, but the column was blocked by the police after just 200 miles, near Rostov-on-Don. The farmers were detained and are now in a hotel in the city. The demonstrators have refused to meet with the Krasnodar territory's governor Veniamin Kondratyev in Krasnodar, inviting him instead to come to Rostov. The Krasnodar Territory authorities insist they are doing enough to protect the interests of farmers in the region, claiming that the protesters are exaggerating the situation. Vyacheslav Lehkodukh, the governor's representative for interaction with farmers, said that the farmers' problems often arise due to non-compliance with legal procedures on their part. The tractor march by Kuban farmers is a sign of the desperation of small producers in agriculture, whose problems are typical for Russia, said Mark Goikhman, an analyst for Russian broker TeleTrade. According to him, small companies are a "weak link" in the agricultural sector. For the state, the priority has always been its reliance on large agricultural holding companies, Goikhman added. Of all the segments of the modern Russian agriculture, grain producers have achieved the maximum success: Russia is comfortably the world’s second largest grain exporter. This type of business is the prerogative of large agricultural producers. "Therefore, all the practical policy towards agricultural producers in the field is subordinated to the interests of big business, which regularly causes friction and conflict over the issues of land lease or access to the infrastructure," said Sergei Khestanov, macroeconomics advisor to the CEO of the Moscow brokerage firm Otkrytiye Broker. According to him, the natural consequence of this process is the rigid consolidation of the agricultural sector in Russia: Large enterprises are increasing their profits and getting even larger. "Large enterprises have more opportunities to develop new technologies and faster return on investment," explained Elmira Krylatykh, a professor at the Russian Presidential Academy of National Economy and Public Administration. This causes small farms to go bankrupt and leave the market, leading to a growth in social tension in the countryside, which provokes protests. "The trend towards consolidation of agricultural producers corresponds to the world trend," said Sergei Khestanov. "In developed countries, employment in the agriculture industry accounts for 1.7-2.5 percent." Large holding companies also actively increase the productivity of labor, which affects the position of the whole industry. "The sector looks much better than the overall economy," said Timur Nigmatullin, a financial analyst at Moscow investment company Finam. "Now, there is a steady process of import substitution in agriculture in Russia, against the background of the combined effect of the devaluation, state support and embargo." According to the state-owned statistical agency Rosstat, in 2015, industrial production in the agricultural sector increased by 3 percent year on year, whereas in the country as a whole, this figure dropped to 3.4 percent. "Big business has become the beneficiary of macro and geopolitical trends, and it’s growing even larger," said Nigmatulin. Valery Solovei, a political analyst and professor at the Moscow State Institute of International Relations, says the kind of protest in which people, frustrated by local authorities, turn directly to the president, is typical for Russia. "This can be called a 'kneeling protest'," he said. Solovei believes that the blocking of the column of Kuban farmers was due to the fact that extensive coverage of the protest is disadvantageous for the authorities – in this case, it could have been joined by the farmers' counterparts from other regions. At the same time, he explained that, with the Sept. 18 elections for the State Duma on the horizon, the regional authorities can meet some of the protesters' demands to calm the discontent. "They can give something back to someone, to punish someone," said Solovei. "The main thing for the government is to ensure calm ahead of the elections, promising everything to everyone at once." At the same time, he added, the state will continue to support big business.